Hey y'all, I disappeared this week! It has been all about work, work, and no play this last week. And I mean work. I haven't even had time to read, and that should really say it all because that's rare unless I'm suffering from reader's block. I'm also in the process of reading a gorgeous science fiction opera book that has been in my TBR since June when it first released! I'm highly enjoying it and can't believe I waited so long to start on it. 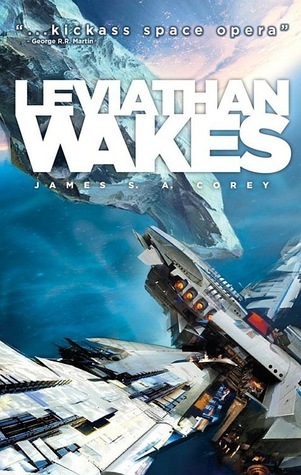 Leviathan Wakes (The Expanse) by James S.A. Corey is a mammoth 592 page book with unforgettable characters, incredible action (so far), and great science fiction details. This is science fiction, though... not sci-fi romance. It has been a while since I read straight sci-fi and forgot how wonderful it can just... be. I promised myself this book would be finished before the end of the year, and it will! It's a personal challenge, lol. I have been carrying another book around with me this whole week though... and I've read a total of five pages! The thing is that this book really caught my eye and I can't wait to get into the meat of it... so, I. am. so. frustrated! You ask... "why aren't you reading right now instead of blogging?" Well, I only have a few minutes break and want the time to enjoy the book... I don't want to read it two pages at a time. I hate doing that. Why this book? Well, how could I resist? It's a combination western, steampunk, paranormal romance! Can you imagine me passing up a cowboy hero in a steampunkish western set up? Hmm... nope! I love the cover too! I love that clockwork horse in the background. 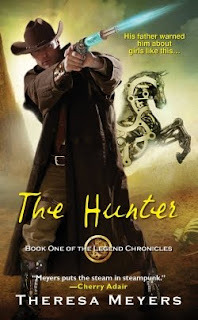 The Hunter is Book One of The Legend Chronicles, so if I like this book where foes are vampires and the heroine is a succubus, then there's a new series in the offing for me! I hope to catch up with my reading, as well as post a few reviews! For now... thank goodness it's Friday!